The Drowned World is J.G. Ballards first novel. It's written more than twenty years before he writes his, probably, best known novel The Empire of The Sun. 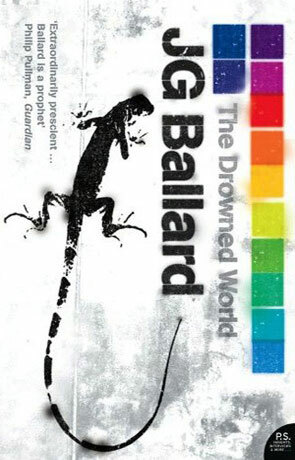 Ballard actually wrote about 10 SF novels (and countless shorts) before he writes Empire of the Sun, and if you enjoyed Empire of the Sun and you enjoy Sci-Fi, you really should take a looks at his earlier works. But you have to be prepared for something rather different. The Drowned world (and I understand that this is true for a lot of his earlier stuff), is quite different from, well, just about everything else. The emphasis is mainly on the psychology of the characters, and so much of the view point of the story comes from the character, that it's nearly surreal. In some ways it's nearly Philip K. Dickish. You can get a bit dizzy and disoriented at time, but luckily you'll not get halfway as confused as the character. Kerans is a doctor/scientist who has gone to one of the drowned cites of the south, where south means anything south of the north pole. You see, as fluctuation in the sun has warmed the earth and the seas has risen and the climate has become warmer. The only places worth living are the south and the north pole. The rest of the world is flooded, and the places that aren't flooded are plagued by extreme temperatures. Kerans has gone south to examine what kind of effect the rise of temperature has on the flora and fauna. It seems that both plants and animals are reverting to an earlier evolutional stage, more fitting to the new climate. But what effect will the climate have on Man? I did find a some of the events in the story a bit unmotivated, but all in all, it's really nice novel, with some really interesting twists and turns. Written on 26th July 2003 by TC.